This research was intended to provide empirical evidences that the exemption of banks from Minister of Finance Decree Number 169/PMK.010/2015 did not raise any significant problem on banks tax avoidance which was measured by effective tax rates. Quantitative method was used in this study by conducting regression-fixed effects method on unbalanced panel data. This study found that thin capitalization in banks did not impact effective tax rates significantly. Present research also found that the banks size and profitability were other determinants of the level of tax avoidance in the banks sample. Bank size and profitability had a significant and negative effect on effective tax rate. Dunn, W. N. (1994). Public Policy Analysis: An Introduction. Second edition, New Jersey: Prentice Hall Inc.
Dyreng, S. D., Hanlon, M., & Maydew, E. L. (2008). Long Run Corporate Tax Avoidance. The Accounting Review, 83(1), 61–82. Ghosh, S., & Chatterjee, G. (2018). Capital structure, ownership and crisis: how different are banks? Journal of Financial Regulation and Compliance, 26(2), 300–330. Harjito, Y., Sari, C. N., & Yulianto. (2017). Tax Aggressiveness Seen From Company Characteristics and Corporate Social Responsibility. Journal of Auditing, Finance, and Forensic Accounting, 5(2), 77-91. Knauer, T., & Sommer, F. (2012). Interest barrier rules as a response to highly leveraged transactions: Evidence from the 2008 German business tax reform. Review of Accounting and Finance, 11(2), 206–232. Kurniasih, T., & Sari, R. M. M. (2013). Pengaruh Return On Assets, Leverage, Corporate Governance, Ukuran Perusahaan dan Kompensasi Rugi Fiskal Pada Tax Avoidance. Buletin Studi Ekonomi, 18(1), 58-66. Lietz, G. (2014). Determinants and Consequences of Corporate Tax Avoidance. University of Munster: Institute of Accounting and Taxation. McGuire, S. T., Wang, D., & Wilson, R. J. (2014). Dual class ownership and tax avoidance. Accounting Review, 89(4), 1487–1516. Mustopadidjaya, A. R. (2002). Manajemen Proses Kebijakan Publik, Formulasi, Implementasi dan Evaluasi Kinerja, Jakarta: LAN. Myers, S. C. (1984). The Capital Structure Puzzle. The Journal of Finance, 39(3), 575. Ngadiman, & Puspitasari, C. (2014). 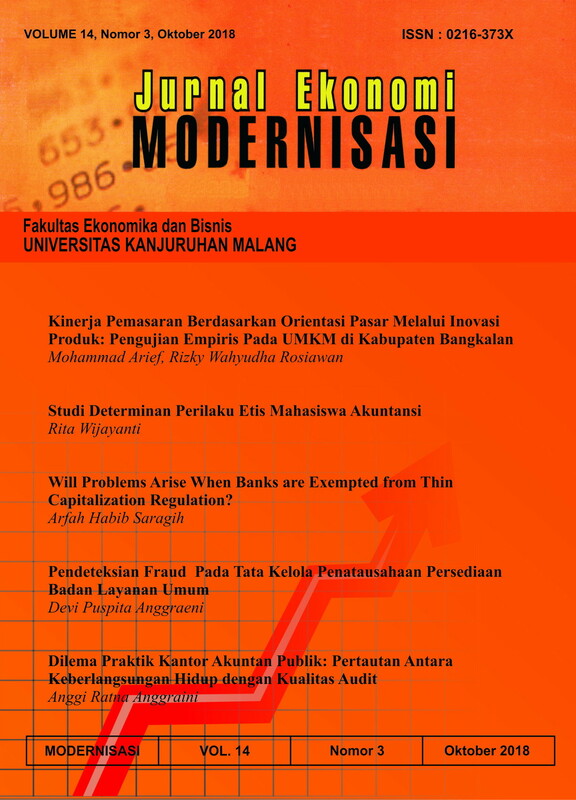 Pengaruh Leverage, Kepemilikan Institusional, Dan Ukuran Perusahaan Terhadap Penghindaran Pajak (Tax Avoidance) Pada Perusahaan Sektor Manufaktur Yang Terdaftar Di Bursa Efek Indonesia 2010-2012. Jurnal Akuntansi, XVIII(03), 408–421. OECD. (2012). Thin Capitalisation Legislation: A Background Paper of Country Tax Administrations. Republik Indonesia. (2015). Peraturan Menteri Keuangan Nomor 169/PMK.010/2015 tentang Penentuan Besarnya Perbandingan antara Utang dan Modal Perusahaan untuk Keperluan Perhitungan Pajak Penghasilan. Richardson, G., & Lanis, R. (2007). Determinants of the variability in corporate effective tax rates and tax reform: Evidence from Australia. Journal of Accounting and Public Policy, 26(6), 689–704. Sherif, M., & Erkol, C. T. (2017). Sukuk and conventional bonds: shareholder wealth perspective. Journal of Islamic Accounting and Business Research, 8(4), 347–374.